Putnam Lodge, built in 1927-28 by the Putnam Lumber Company, is part of a bygone era in Florida’s forestry history. Here, beside the old Dixie Highway, Putnam Lodge, part of the “company town” of Shamrock, accommodated tourists, transients and company executives and clients. 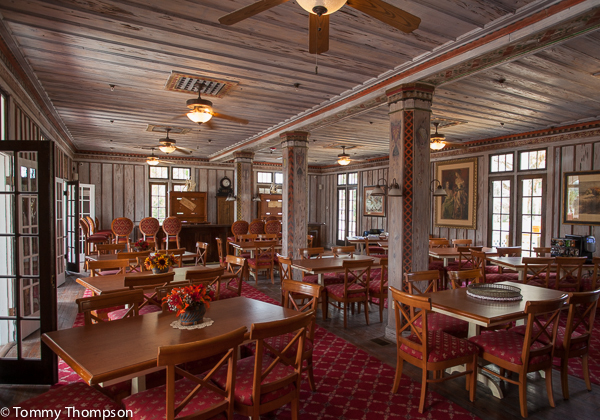 The lobby and the dining room of the 36-room lodge were decorated exclusively with the still preserved, artfully stenciled “pecky cypress,” a now virtually extinct lumber product. In its day, the Putnam Lumber Company, founded by William O’Brien, a timber magnate of Irish descent, and associates including E. B. Putnam, employed hundreds at its two state-of-the-art sawmills in Shamrock. The mills annually produced and shipped worldwide millions of feet of “deep swamp tidewater cypress” and “dense Florida longleaf yellow pine” lumber, products that are now rare because the old growth trees are gone. 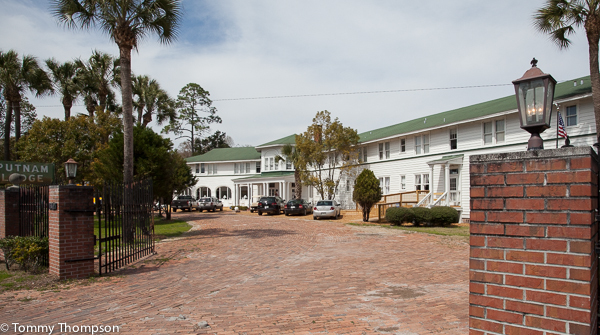 Shamrock provided its residents and employees with comfortable homes, a commissary, a store comparable to “any city department store,” two schools, two hotels, the Shamrock Dairy Farm, and an ice plant producing 18 tons of ice daily. 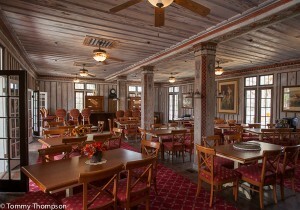 The lodge is representative of a time of local timber supremacy and economic prosperity. 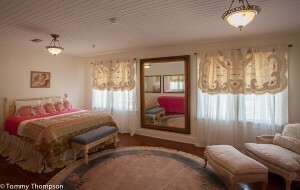 The restored and modernized Putnam Lodge will offer 25 guest rooms (kings, queens, suites–and even a bridal suite! ), meeting facilities for groups of 25-30, facilities for weddings and parties of up to 250, and a full service restaurant and bar. There are even plans underway for a paintball course on an area adjacent to the lodge. Guests at the Putnam Lodge will be impressed by the quality of the restoration. The dining room is almost in its original state, with hand-painted pecky cypress walls, ceilings and columns. The dining room opens onto a newly-constructed deck designed to handle overflow from the dining room during special events. 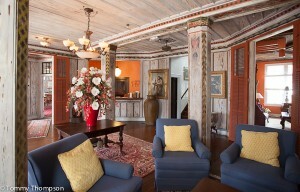 The comfortable lobby and lounges also retain the original design of the Lodge. Modern upgrades like central heating and air conditioning and plumbing make the guest rooms as comfortable as those found in upscale “big-city” hotels. 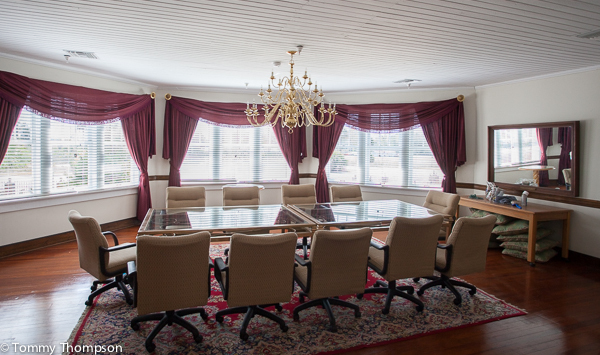 Along with the upscale restaurant offering the finest dining in the area, the Putnam Lodge facility is perfect for small meetings, family reunions, weddings or other social gatherings. Today, Monday April 7,2014, I and seven more of my former classmates, graduates of Dixie County High School visited the new renovated Putnum Lodge.It was such a delight to see the beautiful changes you have accomplished. Mr. Norris McKinney, our group representive called ahead, set up reservations for our group for lunch. The meal was delicious and well served by very polite and well trained waitresses. Superb visit explanations of all the changes made in the building. Our deepest compliments in your endeavor and we wish you a big success. We will be back. Thank you. 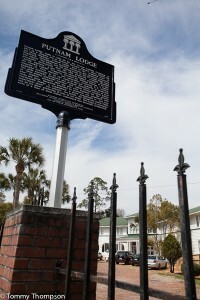 In the 6 years of travelling between St. Petersburg and Tallahassee to visit a friend, I would drive by and think about what history lies beyond the large iron gates. On my way back from Tallahassee this past 4th of July weekend, the gates were open and there was an Open House sign posted out front. With my camera in hand I made my way into the 1927 building. Thank you Beverly for the private tour of the house and property. 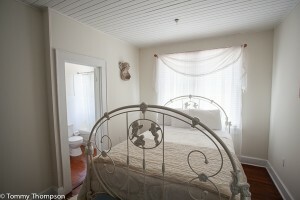 I look forward to a possible stay on my next trip up your way this fall.